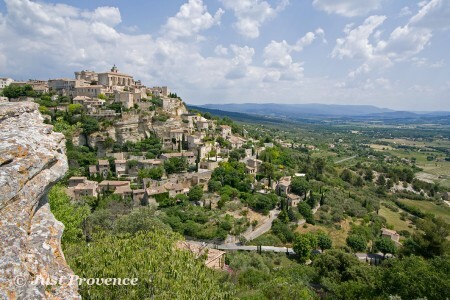 Gordes is a beautiful hill top village perched in the heart of the Luberon National Park. 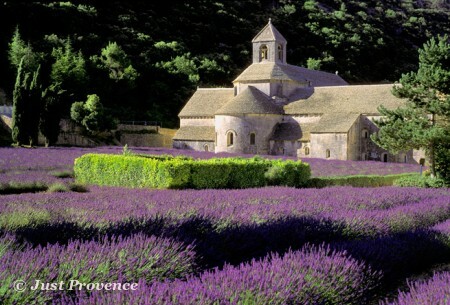 It is classified as one of France's most beautiful villages and is definitely one the brightest gems in Provence's crown. Gordes is a beautiful hilltop village perched in the heart of the Luberon National Park. It is classified as one of France's most beautiful villages and is definitely one of the brightest gems in Provence's crown. This sought-after village offers tourists more attractions than other Provençal villages of similar size. It has a wide selection of restaurants, spas and shops from the family-friendly to the exclusive range of products. Its houses and buildings of white stone root themselves into the sharp cliff of the mountain, its labyrinth of "calades" (narrow cobblestone streets) do not leave the visitor indifferent to its charms. Founded in 1148, Abbaye de Sénanque is a cistercian monastery still in activity today. Since their arrival in Gordes the cistercian monks have been a permanent feature of the development of the area. It has survived slaughter in the 16th century, being sold during the 19th century and expulsion at the beginning of the 20th century. It is justly a very popular attractions among visitors to Luberon. The history of the famous village of Gordes, goes as far back as Antiquity when it was just a celtic fort atop the hill the village now sits on. Gordes has been actively part of Provence's tumultuous history from the post Roman barbaric invasions to the 16th century wars of religion. More recently it was a bastion of the Resistance in the Luberon and the village was awarded a "Croix de guerre" as recognition for its martyr status and its continued sacrifices during the conflict. Gordes is classified as one of France's most beautiful villages and is definitely one of the brightest gems in Provence's crown. Gordes offers more commodities than other Provençal villages of similar size. It has a wide selection of restaurants, spas and shops from the family friendly to the exclusive range of products. Gordes is 45 minutes from Avignon mainly via a dual carriageway and 30 minutes from the market town of Apt, which makes it conveniently close to major towns of the area whilst being in the heart of the Luberon Park. 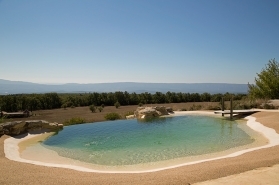 Its ideal location and splendid views makes Gordes the ideal location for staying in one of our luxury vacation rentals. Gordes is a beautiful traditional Provençal village with narrow cobbled streets, that wind ever higher through the tall, ancient houses to the church and castle that stand above the village. 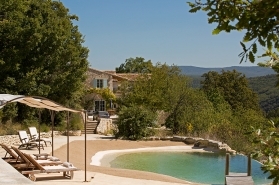 With views across the Luberon mountains. It is also the one of the most visited villages in Luberon. You will be able to find easily parking places on a plateau to the north of the village. As a result your visit will start in the upper part of Gordes, with the castle and church at the top of the hill, followed by a descent to explore the roads further down the hill. This is different to almost all the other perched villages in Provence where you start a visit with a long climb up cobbled paths. Gordes is also well known for its numerous bories. Those ones are constructions made of flat stones, held together with no cement or mortar, the origins of which can be traced back to the Bronze Age. The most recent ones date from the eighteenth century. Gordes' Provençal market takes place every Tuesday morning. With stalls set around the foot of the castle at the centre of the village. The market is renowned as one of the most colourful and beautiful, perfect for taking memorable pictures of your holiday in Provence. You will be able to find all kinds of souvenirs such as soaps, lavender and clothing, but you can also compile the perfect French picnic with freshly baked bread, local olive oil, honey, saucisson, cheese, wine and so on. If you want to find the perfect place for your picnic, take the road out of Gordes to Murs and discover the breathtaking views. Alternatively, Gordes is very well served with amazing restaurants such as Les Cuisines du Château. This tiny French style bistro across from the château may look like a tourist trap, but step inside and you'll find friendly service and tasty home cooking like roast Luberon lamb and beef with truffle sauce. Restaurant l'Estellan is also one of our favorite address in Gordes. A little way outside of town, this restaurant is worth trying thanks to succulent dishes as the sea bream with cherry tomatoes and flax seed, the trilogy of goat and ewe cheese with black olive jam, or the pike perch roasted with risotto.